In one of the recent updates of NET.Notes system got new multilingual user interface. 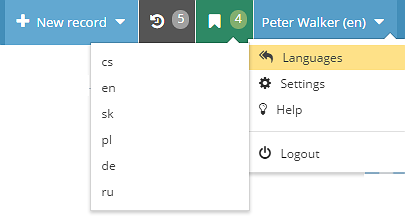 A simple click-through menu by which user can switch to another language. Modified are descriptions of the central user interface as well as individual modules. The system is ready for translation into other languages. To automate the whole process we are able to perform the first step of translation (automatic process) through services of Google Translate . The self-generated translation is then corrected to match the context of the terms used, which automatic translation fails to provide .